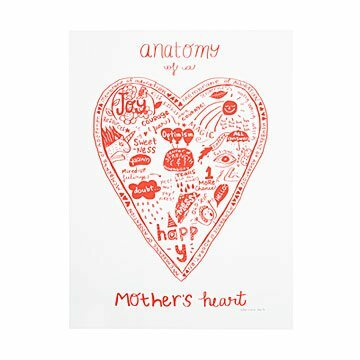 Celebrating the full picture of parenthood, these screen prints feature Sandra Dumais' playful heart illustrations that offer refreshingly honest looks into mom- and dad-ism. Inspired by her own experiences as a parent, Sandra hand-sketches, paints, and digitally draws a narrative interplay of words and images. The result: odes to traits like Mom’s center of strength and Dad’s “jelly center” that make positively charming character studies. Handmade in Montreal. Sandra Dumais' work is inspired by her childhood, children, and the "funny, tender world" around her. "I believe there is a story in everything, and often draw inspiration in the mundane," she says. She took to drawing at a young age, making books out of the musty rolls of wallpaper she found in her linen closet. Her artworks feature a mix of illustration, painting, and digital drawing, culminating in pieces that weave tales through words and images. I had them professionally framed. They now hang above my son and daughter-in-laws bed. They look grand. Thank you very much. Awesome, the sentiments in the hearts are right on spot. I had them professionally framed with a touch of the matching color in the matting. They now hang above my son and wife's side of their bed. They look awesome and my daughter-in-law shows them off when the bed is made. Thank you very much. Perfect Gift for a Mother! I bought this piece and had it framed for my daughter. She is the happy mother of 3 great children. She has loved motherhood more than any person I know. I think she will love it!